The Si's engine is the 1.5-litre inline-four that Honda is putting to use throughout its lineup, including other Civic models and the CR-V crossover. The turbo inside Honda’s latest Civic Si may be new, but the power output isn’t. The redesigned Si will have 205 hp when it goes on sale late this year in Canada, the automaker said Thursday. That’s the same output as its predecessor, despite this being the first time Honda has used a turbo on the Si model. "The 2017 Honda Civic Si is our first turbocharged Si and sets a new sporty compact benchmark in terms of agility and precise handling while building toward the launch of the Type R as the final chapter in our epic 10th-generation Civic story," Jeff Conrad, senior vice president at American Honda, said in a statement. That engine is the 1.5-litre inline-four that Honda is putting to use throughout its lineup, including other Civic models and the CR-V crossover. While horsepower stays the same as the previous Si’s 2.4-litre naturally aspirated engine, peak output happens much earlier than before (1,300 rpm now vs. 7,000 rpm on the previous engine). The new Si also gets more torque: 192 pounds-feet compared with 174 pounds-feet earlier. A short-throw six-speed manual transmission is the only gearbox. The Si also gets normal and sport modes, which control an adaptive suspension and steering and throttle response. A limited-slip differential, retuned suspension, larger front brake rotors and 18-inch wheels round out the mechanical upgrades. The car also comes with a more aggressive front bumper, rear spoiler, centre-mounted single exhaust, unique bolstered front seats, aluminum shift knob and pedals and heated front seats. 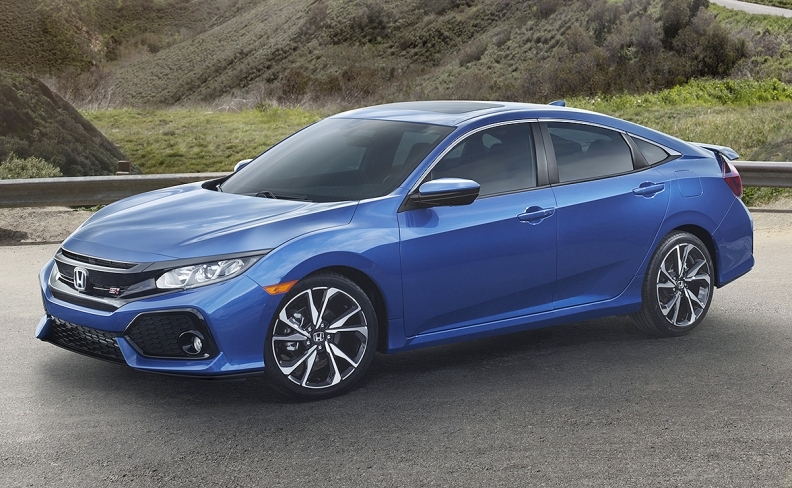 Honda Canada hasn’t released all the details about the Canadian Civic Si but a spokesman said it will be similar to — if not the same as — the U.S. version. Like its predecessor, the Si will come in coupe and sedan variants. Pricing and a sales date in Canada have not been released but a spokesman said it would be on sale soon and that more details will follow. Honda sold 64,552 total Civics in Canada in 2016, making it the top-selling car in the country.